Sometimes, all I have to go on is a CD-ROM. That’s how it was with Roketz. Turns out it’s a DOS game. Time to fire up DOSBox and have at it. 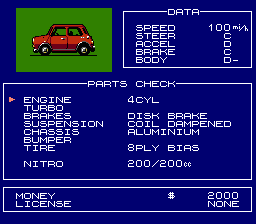 The credits, however, imply that there was also an Amiga version that preceded the DOS version. I had some trouble making a go of this until I remembered to severely crank up the CPU cycles in DOSBox — this game was from 1996, after all. 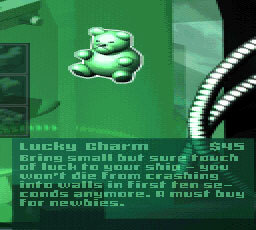 It’s also the first and only game I have seen which uses a 720×350 color graphics mode. 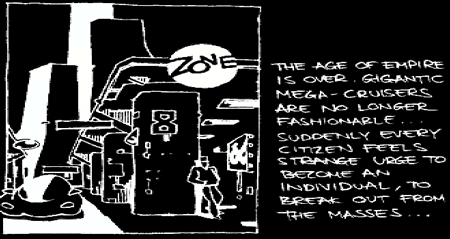 The game is set in a dystopian future, probably — I think the preceding story screenshot was supposed to establish setting for this game. The art style is not in keeping with the rest of the game. As for the game, it reminds me a lot of those Positech racing games I played quite some time ago. 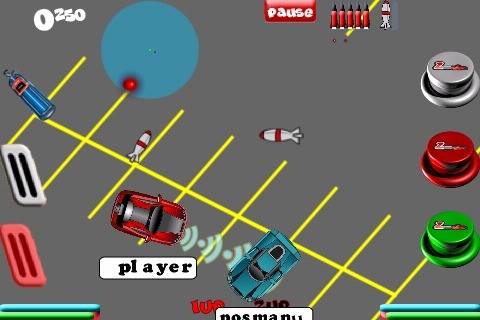 Race around a 2D map and shoot at other players while collecting powerups. 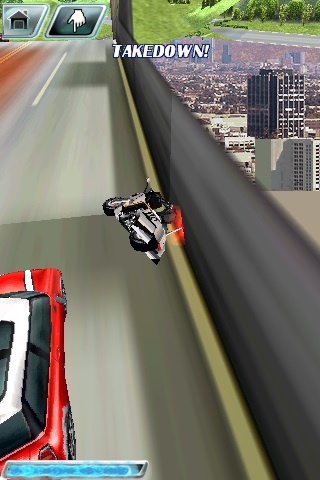 This game functions in both free-for-all combat mode as well as lap racing mode. Some fellow MobyGamers are steadily whittling away at my list of missing NES games. I thought tonight would be a good night to attack a few more NES titles that looked interesting before they all get snatched up for entry. 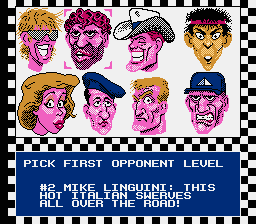 And I thought I had already purged the NES list of all racing titles. But I found 2 more to play tonight, one that even has “race” in the title. I suspect Google will soon pick that up as its top image search for “italian stereotype”. Other competitors include Ito Speedo, Pierce Sedan, and Hans Von Brakemann. Other interesting aspects of this racer include its diversity of perspectives and its control scheme. 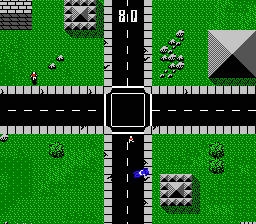 Depending on the phase of the race, the action might be third-person, side-scrolling, or top-down. You are either allotted 1/2 or 1/4 of the screen depending on whether you are in the lead. And the screen shift can be quite disorienting when you gain or lose that lead. The control system took a little figuring out. At first, I couldn’t figure out how to move. Then I managed to move but ever so slowly. It was like a race car stuck in 1st — only literally! 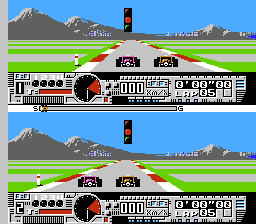 Eventually, I reasoned out how the control system works (for anyone scouring the internet for help on this forgotten title): Up and down on the control pad upshift and downshift, respectively. However, these only work if you are not pressing the gas button (A). The second game tonight was Stunt Kids. I don’t have much to say about this one except that I suspect it’s an Excitebike clone. I can’t be certain at this time because I have never played Excitebike. I wasn’t very good at this game. I spent most of the game flying off my bike. 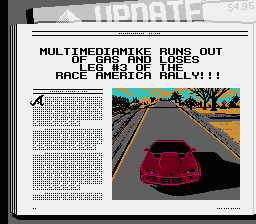 The computer beat me handily but I think I was only racing against the clock. So I was flying internationally and there was an onboard duty-free shop. 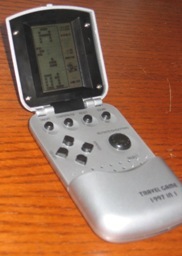 Since I wouldn’t be doing much with this blog during my absence, I just knew I just had to buy this thing and write it up when I returned: Travel Game 1997 In 1 from Premier Portfolio. Understandably, you might be a wee bit suspicious of the claim that this wondrous little device actually contains one thousand nine hundred and ninety-seven unique games. My first guess was that it had one game and 1997 different levels for that one game. 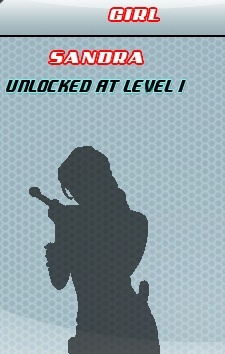 At best, I figured that it would have several different games and hundreds of levels for each. This latter assumption turns out to be correct. There are, in fact, 14 unique games listed on the tri-lingual instruction manual– err, instruction scrap-of-paper. Several of them, however, are the same concept repeated over and over again. 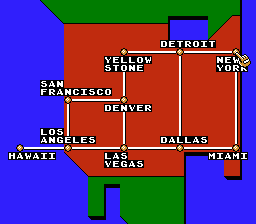 On a technical level, the game screen has a tall rectangle drawn around the left 3/4. This is the area that contains 200 individually-addressed picture elements arranged in a 10×20 grid. The right quarter has a few other hardwired elements such as the score. There is a speaker that sounds like one synthesized channel which can still produce a useful array of sound effects. 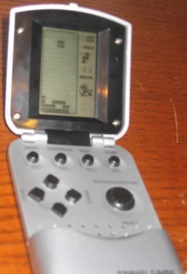 The controls allow you to select among the 14 games, play them, force a hard reset to select a new game, and toggle the sound. Further, when starting the system, “MIRADA” scrolls across the screen. Developer, perhaps? I didn’t have time to disassemble the unit to learn more, though the screws are straightforward enough. The mechanics of all 3 games are the same. You can move to the left or right or speed up (since the car moves pretty slow by default). 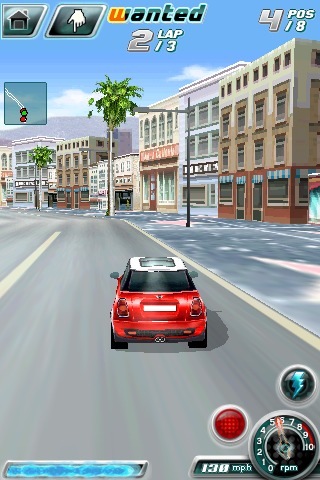 The car racing game just has the player maneuvering on a narrow race track. 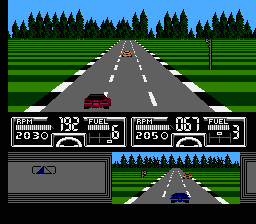 The 2- and 3-line car racing games have cars in 2 or 3 lanes that you must dodge. There is a “Tank Fighting” game where you navigate your tank around the field and shoot other tanks will avoiding obstacles. The tanks each occupy 3×3 grid blocks so it’s a pretty crowded game. A game called “Shooting” simply has a bunch of blocks gradually but relentlessly descending. Shoot them before they reach you. There is “Single Pinball” and “Double Pinball”. They are both Breakout/Arkanoid-type games. They also strike me as somewhat flawed. It can probably be proven mathematically given the constraints of the system, but I was able to show empirically that it was easy to get the game into a state where the ball followed the same pattern and could not clear a screen until you let the ball drop. The double pinball game differs from the single variant in that there is a paddle at the top of the screen that you are controlling simultaneously with the one on the bottom. I.e., there is no hard border at the top. I assumed that the game “Shooting Space” would be a Space Invaders clone. In fact, I have never seen anything quite like it. One row of random blocks descends one level, followed slowly by another. You have to shoot more blocks upwards in order to complete lines and keep the blocks from reaching the lower level. It’s sort of like an inverted Tetris. So I can understand why they would shy away from using the name Tetris. But that doesn’t square with the fact that they openly call their Galaxian clone “Galaxian”. 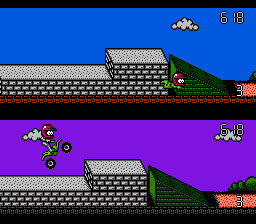 “Cross The Fire Line” is a Frogger clone when it comes right down to it while “Dragon Pearl” is a variation of the common Nibbles theme. The unit also has a game called “Crazy Ball” which I think is supposed to be a Pong-type game. I’ve never played the original Pong so I don’t know if Pong is supposed to be this naive. 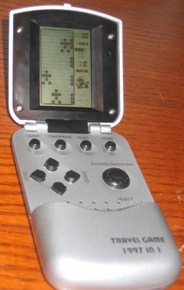 The computer player simply moves back and forth in a constant manner. It’s still hard to beat the computer since the paddle is 1/3 the width of the screen. 3 blocks slowly descend from the top of the screen, Tetris-style. They do not initially match the blocks in the same position on the bottom of the screen. It is your job to alter the blocks within the group in order to make them match the bottom blocks before the group reaches the bottom. The left arrow rotates through block types for the first block, up or down controls the second block, and right manages the third. I bought this odd item on my way back to the U.S. and my first stop was to visit some relatives. My young nephew seemed far more impressed with this device than I was. So I just collected enough notes for this post and let him have it. I’m glad it will get some use.